In two years of business school, I learned 10 things that were worth the effort. Approximately. Almost all of these fell into the general category of: find a problem people have, make or do something that solves that problem, do it better than anyone else, find a good way to explain why your way is better, and then find the people who care and tell them over and over and over again. Or that accounting is a terrible, terrible invention. Or that good team chemistry can make almost any assignment bearable. Never mind that. In the interest of how to have a career that keeps you fierce at 50, introducing, for those who are lucky enough not to have gone to business school, the Risk/Return curve. It was developed by exceedingly smart economists (whose names I can't remember) to understand financial investing. Why use a concept from the impenetrable world of finance and investments? Think about it. Every job you take is an investment of your time. I sound like one of those mellifluous voices on public television speaking to rapt audiences of middle-aged women but I can’t help it. From the vantage point of my 50's, this is true. Your time is what you really have in life, and you choose where to invest it. 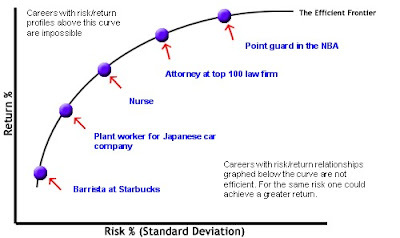 You can interpret the risk/return curve as follows. ON AVERAGE, those investments with the highest probability of a big return are also the riskiest. They are the ones who also have the highest probability of little or no return. They are volatile. Those investments which have ON AVERAGE the lowest return are the safest. Low risk, very predictable, equals probable low return. High risk, higher volatility, equals possible higher return. You invest on what they call the Efficient Frontier. Where you are taking the right amount of risk for the possible return. No more, no less. How does this idea work to model your career? It doesn't mean that risky jobs earn big returns. It means that risky careers earn big returns. The careers where you go after jobs and opportunities where success is not guaranteed, or where success requires a big investment in time. To earn a lot of money and fame, the returns on investment for your career, you have to take risks. You can incur the risk of going to school for a long time, like law school, or the debt risk of starting your own business, or the statistical risk of trying for a career that millions of people want in athletics or entertainment or at the top of the corporate pyramid, or the sheer win-loss risk of pure financial investing. But risks have to be taken to be successful in the ways of recognition and fortune. Anyone who tells you otherwise is trying to make money from your gullible self. The fear you have of going after your heart's dream? It's logical. To be expected. You are supposed to be afraid. Risk/return. However, careers differ from financial markets in several ways. Most importantly, one assumes that the financial Efficient Frontier is pretty much knowable. That the information is out there for you to locate yourself right on the black line. This is the concept of a perfect market (which of course is always being broken by greed and manipulation and regulation and deregulation but never mind all that terrible stuff that forced me to watch hours of Saturday Night Live when I was in business school in order to recover from the sheer horror). Morningstar and Motley Fool and people who are good with quantitative analysis put enormous amounts of data into enormous computers and get numberish things back. Betas. Standard deviations. Makes me say eek. That’s how risk/return is understood in finance. Life, that little sucker, is not a perfect market. We do not have perfect information. No trading pits for jobs which generate huge amounts of data to be analyzed by huge computers. The information is much more qualitative. Harder to find. And this is the task. Increasing our access to information to balance our risk with our returns. To stay on our own efficient frontier. I am not done yet. However, to make sure I mislead no one, let me say I would never claim to have universal answers. Living until 52 and then misplacing your job and spending an inordinate amount of time sitting on the sofa and staring out the window doesn’t provide answers. No matter how lovely the roses. Driving on the freeway and suffering from raptures of the open horizon and California summer doesn’t provide answers. Even solving the problems of notecards and envelopes doesn’t provide answers. Just a glimpse of framework. A mode of thinking that can pare away emotion from a problem and leave space to consider. Now you see why I didn't love business school:). More colorful anecdotes to follow. This is so interesting; as a member of one of these professions, married to one of the same, we tend to look at the NBA stars / entrepreneurs & think, "Now THOSE guys really risked a lot for a lot of return. "; to overgeneralize, we generally fancy ourselves a uniquely risk-averse bunch, forgetting the time/$$ we've put in. Nothing like a good dose of perspective. Also - California summers may not be the answer, but they sure do feel like it sometimes. And California summer? Sounds good; here on the other coast, we no longer believe summer exists. Thank you for pinpointing so precisely why I am terrified of graduating and completing my life as a student: now the risks will have real consequences. This post took me back to business school and the terror of graduating and then "now what?" Now, basically retired from design and a kept woman I look around me and fantasize about risk...sometimes. Ahh, that brings back memories. Do I miss using curves to illustrate a point in my presentations to clients? Not really.